I made this for the world card making day at Our Daily Bread Design. 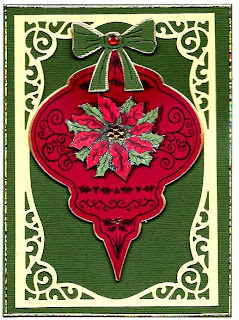 I used their gorgeous Large Ornament with the matching spellbinders die. I stamped the ornament twice, once on the red and then on white and colored it with copics and cut out the poinsettia and popped it up, added some yellow gems to the center and colored in the holly leaves with a spica pen and added some tiny red gems to the holly. 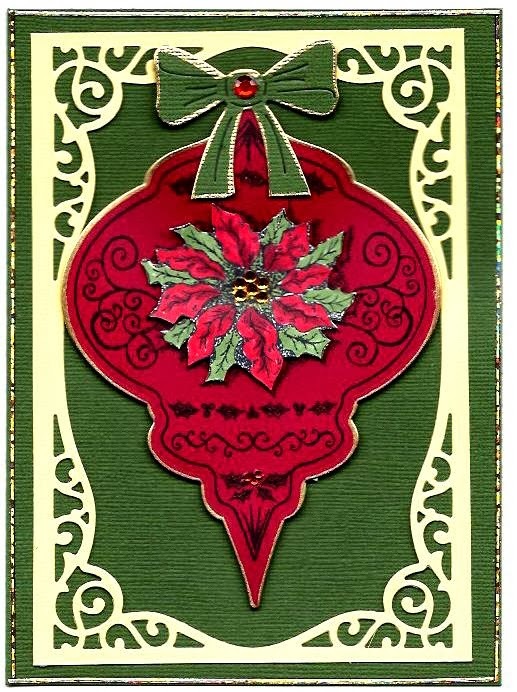 The border is a Spellbinders majestic labels 25 and the bow is from Cheery Lynn. I edged the ornament with a gold pen and gold peel off borders around the card. Card size is 5x7. Pretty Karen - love how you framed the ornament! Thanks for playing along with ODBD WCMD Challenge!